But let’s have a look together on what is going on in Vancity this weekend, shall we? OH! Vancouver. OH! Vancouver? If you don’t remember this name from last year, then let me explain what it is: OH! Vancouver is an installation that lets you control the lights at Science World. Yes, you read that right. You have the chance to actually control all those little bulbs of the Vancouver monument. But hurry up, today (24 August) is your last chance to do so. 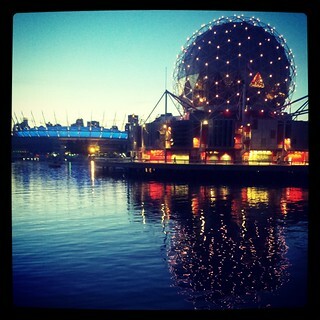 Go to Olympic Village Seawall – 1 Athletes Way between 9:30pm and 11:30pm and enjoy the fun! Shoe-shopaholics, this is for you: TOMS has a big warehouse sale from now until Sunday, August 26. Where? At Richmond Olympic Oval – 6111 River Road. Over 30,000 pairs of shoes will be discounted. Some items are even 70% off. Sweet! This is something for everyone: women, men, kids and babies can benefit from this awesome offer! On Sunday, there is a Full Moon Morning Beach Party. A party, in the morning? Yes, because this party is all about partying for wellness and community, hosted by Party4Health. The goal is to get high on each other, not on alcohol nor drugs. Admission is free and you get to enjoy your time there from 9am until 12pm. So, your morning activity on Sunday is covered. Time for more good times in the afternoon! Luckily, there is the Sunday Afternoon Salsa at Robson Square. At 3pm and 7pm, you have the chance to participate in beginner dance lessons. And at 5pm, you can watch the professionals giving their performances. Admission for this event is free too. Fun times ahead in Vancity, I guess. I wish you a great weekend and hope you’ll join to Bowen Island this Sunday!